George Irving Shirley was born in Indianapolis, Indiana on April 18, 1934. At age 6, his family relocated to Detroit, Michigan, where he began music lessons. He was active as a vocalist at churches in the area and as a baritone horn player in a local band. Shirley entered Wayne State University in Detroit as a music education major, receiving his bachelors degree in 1955. He was drafted into the military the following year and became the first African-American member of the United States Army Chorus. After his discharge in 1959, he continued studying voice with Therny Georgi, then he moved to New York where his professional career began. He made his debut with a small opera troupe at Woodstock, New York, as Eisenstein in their production of Die Fledermaus. He then journeyed to Italy and made his European debut as Rodolfo in the Puccini opera, La Boheme. In 1961, he won the Metropolitan Opera Auditions by performing "Nessum dorma," beginning an eleven-year association with the house. While at the Met, he sang a 28 different roles from 26 operas, especially those of Mozart, Verdi, Puccini, Strauss and Wagner. Shirley received a Grammy Award in 1968 for singing the role Ferrando in the RCA recording of Mozart's Così fan tutte. From the 1960s to the present, Shirley has performed on the concert stage, singing recitals and oratorios. He has premiered several works during his career, on both the concert and operatic stages. In recent years, he again became involved with education. He taught at the University of Maryland from 1980 until he accepted a position at the University of Michigan in 1987. He currently serves there as Director of the Vocal Arts Division, Joseph Edgar Maddy Distinguished University Professor of Music. 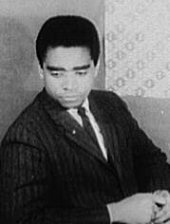 George Shirley is a tenor whose voice has been known for its vibrancy and flexibility. His power and richness of sound easily filled a opera house or a concert hall. 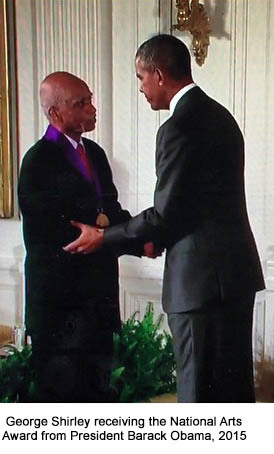 1 "U-M's University Musical Society, George Shirley to receive National Medal of Arts" Michigan News, accessed September 11, 2015, http://ns.umich.edu/new/multimedia/slideshows/23100-u-m-s-university-musical-society-george-shirley-to-receive-national-medal-of-arts. Musical excerpt: "Ah! lo veggio quell'anima bella" from Cosi fan tutte by Wolfgang Amadeus Mozart. Recorded by George Shirley, August-September 1967. RCA Red Seal/Sony BMG Masterworks, 2006. Please submit contributions, comments, or suggestions to Randye Jones. Contents of Afrocentric Voices may be used for non-commercial purposes only if the source is acknowledged. All material remains the property of its creator. All commercial rights reserved. Afrocentric Voices in Classical Music. Created by Randye Jones. Created/Last modified: September 10, 2015. Accessed: . http://www.afrovoices.com/shirley.html.